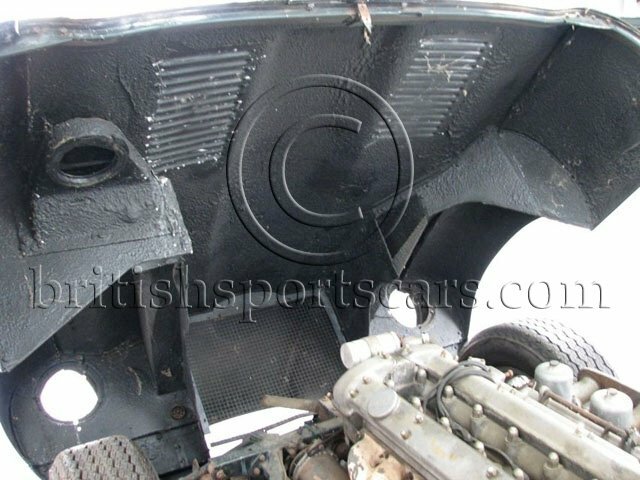 You are looking at a very rare 1962 Series 1 Jaguar XKE Flat Floor. The flat-floor cars were manufactured in very limited numbers at the beginning of XKE production and are quite collectible. This particular car is a long-time California car that has been in dry storage here locally for many years. Restoration was started many years ago and then the car was put into storage. The car shows no signs of any accident damage and the only rust/repair that can be found is in the bottom left-hand corner of the boot. The original color of the car is British Racing Green but has been repainted black. The paint is very nice but does need a few touch ups. This is a very straight and solid car. This is one of the last flat-floor cars produced so it does not have the welded lower bonnet like the very early cars. It is the original bonnet to the car. This is a matching-numbers, 3.8 liter car. We have had the car running and it runs great. The car obviously has a long way to go but an early flat-floor car is very collectible and worth spending the time and money on. The car is missing all the glass, radiator, front bumpers, boot boards, headlamps and all pieces for them.